The appreciators of Varzi salami are more and more numerous. This pre-sliced salami ​​records a jump by +208% in just one year. Its sale started in the most important foreign markets: in Germany and England. Now it will be necessary to strengthen export. 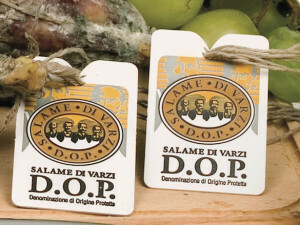 The numbers concerning production of this PDO speciality in 2014 were communicated by ‘Salame di Varzi’ producers association: 441,394 certified salami were produced by the Consortium. These numbers are in line with the previous year. 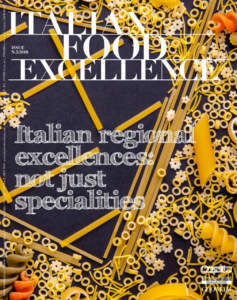 However, the performance of pre-sliced product is noteworthy, ​​with 65,681 produced trays: an increase by 208% in just twelve months (source: IPQ - Istituto Parma Qualità - Parma Quality Institute). 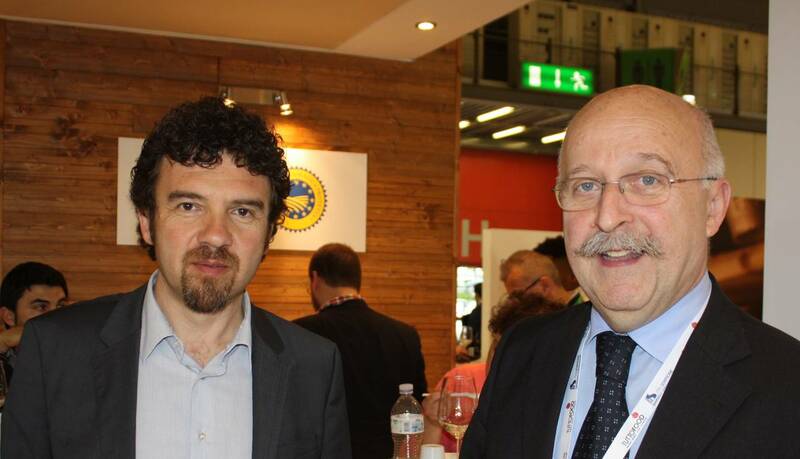 Fabio Bergonzi, President of ‘Salame di Varzi’ producers association, said: “Until recent times, our product was mainly known in Lombardy. But today the situation is no longer this one. We see some attention from abroad, too, mainly from Germany and England, but the exported quantities are still very limited. 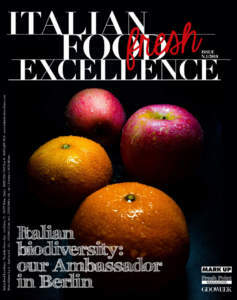 One of the next aims of our producers association consists in proposing this excellence of our Country to consumers around the world, too”. The origins of Varzi salami date back to very ancient times. As a matter of fact, according to tradition the Longobards already used salami as their favourite food during their migrations, thanks to both its characteristics in terms of preservability and undoubted nutritional properties. 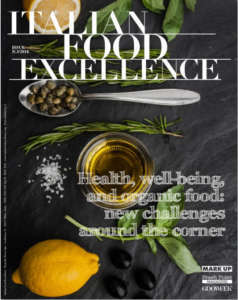 Later, in the thirteenth century, Varzi salami arrived to the tables of Malaspina family, who chose it as noble and delicious food, reserved for the most distinguished guests at their table. In later centuries, Varzi salami gradually spread among the people: with the spreading of pig farming, peasants and farmers, too, began to eat salami, which were available in larger quantities. Thus Varzi salami became more and more present on the tables. 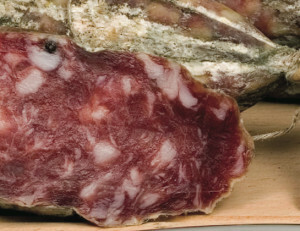 Varzi salami is prepared with minced pork meat, expertly mixed with sea salt, peppercorns, and garlic infused in red wine. In the processing of Varzi salami, different cuts of meat are used, even the best parts, such as thigh. The raw material is carefully and accurately selected, in order to give the seasoned product the characteristics of softness and scent that distinguish it. When cut, it presents an elongated shape (so meaning the shape of the slice of salami, which must be cut as ‘clarinet spout’), soft texture, and bright red colour. Its flavour is typically sweet and delicate and combines with fragrant and characteristic scents and aromas, strictly conditioned by the seasoning time. This consortium, at the beginning a voluntary one, was formed in June 1984 with the aim of achieving the recognition of the Denomination of Origin, as well as proposing promotional activities, supervision, protection, and guarantee of the product. It boasts 12 producers as its members. 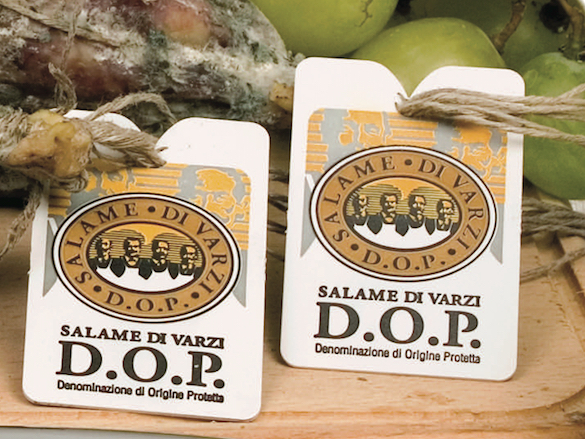 Since 2001, PDO Varzi salami has been certified by the Ministry of Agriculture and Forestry; checks are performed by ‘Parma Qualità’ Institute.